Demi Lovato Slams Lady Gaga For "Glamorizing Eating Disorders"
Photo: MediaPunch Inc/REX USA; Henry Lamb/BEImages. Say what you want about the monolithic entertainment behemoth that is Lady Gaga. Whether you think she's the visionary she claims to be — or that she's just in it for the shock value — the truth is homegirl knows how to put on a show. Her tendency to give a big middle finger to the line between art and totally inappropriate is one of the things that we love about her. But, her latest performance at SXSW may have gone too far. Here's what went down: During her rendition of "Swine," Gaga was joined by an artist named Millie Brown, who proceeded to stick two of her fingers into her mouth and simulate vomiting with bright green paint. While much of the Internet reacted with the typical, "That's just Gaga!" response, one very famous Little Monster saw this as something much more sinister. Demi Lovato lashed out in a series of tweets over the weekend, arguing that Gaga's performance served to "glamorize eating disorders." Sad... As if we didn't have enough people glamorizing eat disorders already. ? Bottom line, it's not "cool" or "artsy" at all. Would you let someone bring a needle and shoot up on you? Addiction is addiction. Whatever your thoughts on what you just saw, it's hard to argue with the fact that the imagery is, at the very least, a potential trigger for people who might be suffering from eating disorders. 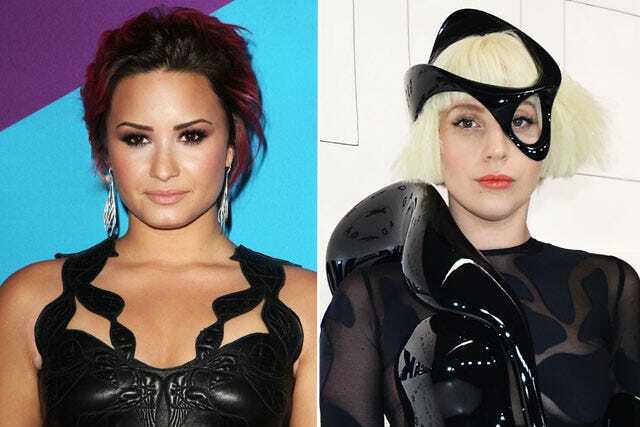 We think it bears mentioning here, especially in the context of Lovato's comments, that Gaga herself has admitted to battling an eating disorder for over a decade. After all, if anyone should be able to recognize something that could set-off eating-disorder patients, you'd think it would be someone who has gone through it themselves. Yes, Gaga is an Artist with a capital A, and yes, it could be argued that it wasn't her intention to make any sort of statement about bulimia with this performance. But, as eating-disorder specialist Dana Schmitt, LSCSW, says, "Her act can be interpreted in many ways, and if one of those ways is that the bulimic symptom of vomiting is acceptable for art, then that is not showing understanding for the severity of bulimia as the life threatening disease that it is." Gaga has yet to make a comment.